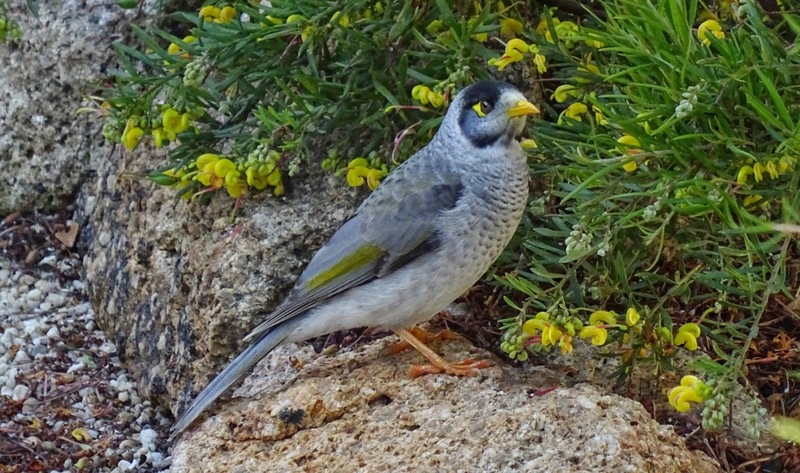 The noisy miner (Manorina melanocephala) is a bird in the honeyeater family, Meliphagidae, and is endemic to eastern and south-eastern Australia. This miner is a grey bird, with a black head, orange-yellow beak and feet, a distinctive yellow patch behind the eye and white tips on the tail feathers. Males, females and juveniles are similar in appearance, though young birds are a brownish-grey. As the common name suggests, the noisy miner is a vocal species with a large range of songs, calls, scoldings and alarms, and almost constant vocalisations particularly from young birds. Noisy miners are gregarious and territorial; they forage, bathe, roost, breed and defend territory communally, forming colonies that can contain several hundred birds. Each bird has an 'activity space' and birds with overlapping activity spaces form associations called 'coteries', the most stable units within the colony. The birds also form temporary flocks called 'coalitions' for specific activities such as mobbing a predator. Foraging in the canopy of trees and on trunks and branches and on the ground, the noisy miner mainly eats nectar, fruit and insects. Most time is spent gleaning the foliage of eucalypts, and it can meet most of its nutritional needs from manna, honeydew and lerp gathered from the foliage. This bird was feeding on a beautiful yellow grevillea, which is currently in full bloom in Melbourne. Hello, it is a beautiful bird. I wish I could see it in person. Thank you so much for linking up and sharing your post. Happy Saturday, enjoy your day and weekend. Oh he is very pretty!